How YOU can (EASILY) make Guide Dogs more effective! Happy International Guide Dogs Week people! When I see a Guide Dog I am filled with admiration, excitement & curiousity. Truthfully I want to run right over to that dog, slather that dog with love and say ‘Congratulations mate. You rock!’. LUCKILY I have impulse control! So I am able (*just*) to hold myself back. And really this is more important than you might think. In celebration of International Guide Dog Day let’s talk Guide Dog etiquette. Guide Dogs do absolutely vital work for their people. They are highly trained to help their handlers navigate safely through the world. This is a BIG job and takes over $35,000 worth of training! We sponsored the training of an Assistance Dog named Waggle a few years back. It was quite exciting and amazing to see all that is involved in creating a canine life saver. Resist patting & chatting to that superheroic hunk of furry love. Try to lead a friend blind folded through an obstacle course. Even with a common spoken language it’s easy for humans to make an error of judgement. These dogs need to concentrate on what they’re doing. Even when a service dog appears to be just chilling, doing absolutely nothing, if that dog is wearing a recognisable harness or uniform, then that dog is ON DUTY and should be respected & admired, calmly & quietly from a reasonable distance. It doesn’t matter whether the dog is physically guiding a person or just sitting at that person’s feet. If you’ve ever trained a dog you might have noticed first hand how distraction and mixed messages can undo months of training quicker than you can say “Fido sit!”. Frequent distraction can cause anxiety or injury to the dogs and their handlers. No matter how innocent your lovely intention, distraction has a negative impact on a Guide Dog’s focus. Most people know they shouldn’t pat Guide Dogs, right? Well, in a survey conducted in 2015, 89% of Guide Dog handlers noted that their Guide Dog had been distracted by members of the public in the past 12 months. And 83% of Guide Dogs had been distracted by off lead dogs in the last year. Those are whopping statistics and not in our favour as helpful fellow citizens. In some cases perfectly trained Guide Dogs have been forced into early retirement due to the impact of this disruption to their training. Australia’s Got Talent-ed Guide Dogs! Are you familiar with Matt McLaren, a recent finalist in Australia’s Got Talent? At a recent gig, Matt was carrying a keyboard into a venue and a member of the public wanted to play with his Guide Dog. “There was a staircase straight ahead, but as Stamford was not on the ball, I walked straight into it,” he said. Let’s work to improve the stats for next year! Spread the word. Hold back. Watch & admire. Dissuade crazy dog lovers and children from approaching and interacting with service dogs on duty. We can do it folks! These fabulous dogs will have a better opportunity to get their important jobs done well. Have a most waggly weekend and all the very best to your pack! April 29, 2016 | Filed under Inspiration, Living With Dogs, Uncategorized, Working Dogs and tagged with #respectmyuniform. 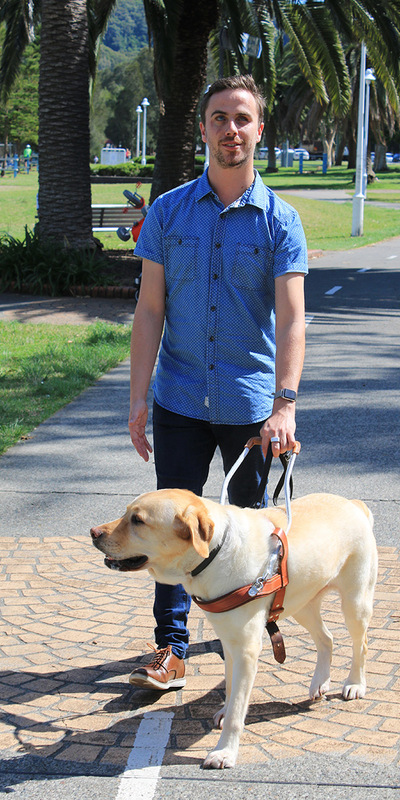 One Response to How YOU can (EASILY) make Guide Dogs more effective! Thank you Waggle. I’m a dog gide handler and really appreciate you getting the word out there about not distracting my guide dog. I just wanted to add a scenario that I come up against most days…waiting in line for lunch, for the bank or post office, the person behind thinks it’s a good way to pass time talking and patting my dog; now, she knows her job and gets a bit grumpy with that and is hard to get sorted. all this while you are in line. And, just step it up a notch, the number of times I’m ordering lunch or trying to use an ATM and someone says ‘Can I pat your dog?’ or just does it is not good. My dog is an amazing worker but of course she’s going to choose the pat! Thanks to all those out there who respect the work she does and let’s her get on with it. She’s my independence and best friend.